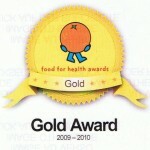 Easy Gourmet has been a recipient of a Gold Award in the Food for Health Awards. For us, healthy eating goes hand in hand with fresh food prepared on a daily basis. Our menus are designed to be nutritious, well balanced and cover most of the 5-a-day requirements needed to maintain a healthy lifestyle. 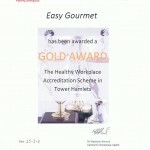 Easy Gourmet was very pleased to participate to this award and achieve a Gold Award. The company has now 2 bikes for the staff to use for shopping or going home, we are also started a local yoga classes and we Love it. The Centre for Workplace Health (CWPH) has been commissioned to deliver the Healthy Workplace Project in Tower Hamlets. The innovative programmed was to improve the health and wellbeing of their employees during 2010-11. Organisations was provided with a menu of healthy opportunities to skill up employees and to best meet the needs of their business.